This is a workshop to introduce the Public Lab community to members of Citizens without Borders and Science has no Borders meetup groups. It the first in a series of activities on environmental monitoring. We will introduce near infrared sensing and the PL approach, including the development of tools and application. The follow-up workshops include NIR image processing using infragram.org and discussion and calibration as well as DIY aerial mapping using kites. Is there any possibility to get to know more about the making this particular camera? Im a young artist who is also searching for the "best recepie" to create near infrared camera for my next installation. Thank you very much for your reply! @Annchy1809 there is also a step-by-step guide in youtube: https://www.youtube.com/watch?v=XFOHWaL7XsM&t=797s&list=WL&index=1 -- you can ignore the last part of the video and instead replace the glass filter in the camera with a blue filter: https://store.publiclab.org/collections/diy-infrared-photography/products/infragram-diy-filter-pack - hope this helps! Thank you very much mathew and Cindy_ExCities!!! Some light passes through human skin, and near infrared light (especially around 800 nm) passes through more readily than visible light. Skin also scatters near infrared light after it has entered the skin, so near infrared photos of skin can appear whitish, waxy, glowing, and ghostly. Near infrared light is absorbed strongly by blood, so veins look dark in near infrared photos. So near infrared photos of skin can highlight veins that are not too deep under the skin. The best results for highlighting veins might be pure infrared photos. Such photos can be taken by either illuminating the scene with pure infrared light or by using a filter which passses only near infrared light. Cameras converted by replacing the IR cut filter with a blue filter will capture infrared and red light mixed in the red channel. Using a red filter instead will allow capture of rather pure infrared light in the blue channel. Using exposed developed color slide film or a Wratten 87 filter will allow all three channels to capture only near infrared light. Using a narrow band filter which passes only light near 850 nm might be best. 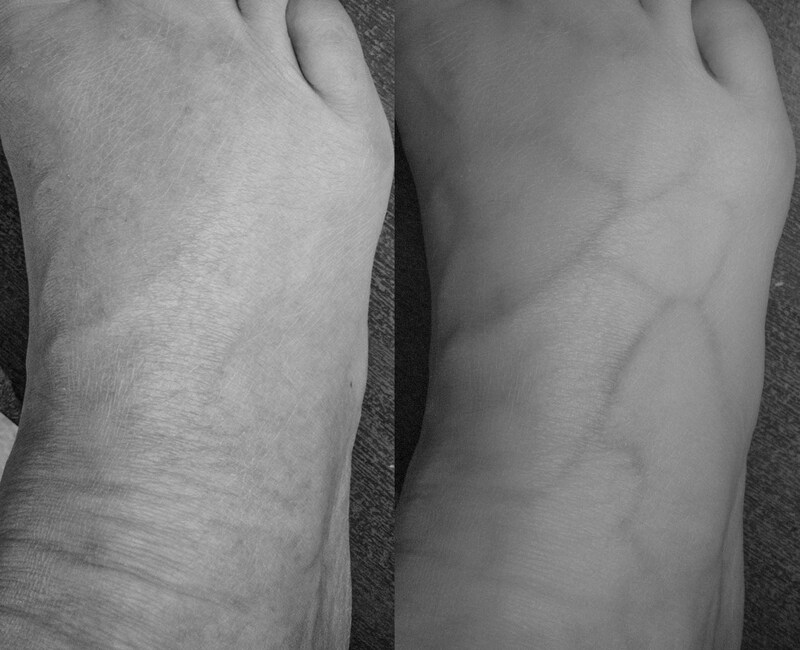 Above: Black and white photos of the top surface of the right foot of a normal healthy caucasian (and otherwise not unattractive) male taken with a normal visible light camera (left) and with a camera modified to capture only light between 850 nm and about 1000 nm (right). The foot was illuminated with an incandescent lamp. Waw, thank you very much Chris! cfastie , I am sorry but I can not resist to have one more question! Does anyone has any experiences with it? Thank you very much again for your replies and informations! It would be possible to make a version of that device. It requires a digital projector which will be an expensive component (but maybe under $100). The live video (or recent still image) from the camera must be projected in near real time by the projector. Both the camera and projector must be capable of focusing rather close (20-30 cm). The camera and projector must be mounted solidly and close together so the image can be projected onto the exact scene that the camera records. The infrared image will probably have to be altered to highlight the patterns of interest (e.g., veins). I am not sure how to do that without passing the image through a computer before it gets projected, but maybe some cameras or projectors have presets or controls for contrast or color balance that will enhance the patterns. Aaaa I see! So its all about the adding the contrast and projecting the image straight from the camera? That seems to be one simple way to do it.